It wasn’t a close game, and in fact it never was going to be, as the New England Patriots bossed the Tampa Bay Buccaneers from start to finish at Wembley Stadium in London, England. Still, six total touchdowns, no rain, and a masterclass from Tom Brady was well worth the entrance fee, and the slick Patriots offense had all of the fans from across Europe hypnotised. I was sad not to see Randy Moss score a touchdown, but I did enjoy seeing the likes of Buccaneers RB Carnell ‘Cadillac’ Williams warming up in front of me, as well as witnessing Junior (oh the irony) Seau suit up and go after Josh Freeman as late as the fourth quarter. The big questions now being asked are Can London host MORE than just one NFL regular season game? and in the future could there be enough interest for England to have its very own NFL franchise? Judging by the knowledgable fans (yes here in England we do know the difference between the Wishbone and the Wildcat, and we can spot someone who has just been found guilty of illegal motion) I think that it is possible to sustain an NFL franchise here. 84,000 fans made their pilgrimage to Wembley from across England, Scotland, Wales, Northern Ireland, the Republic of Ireland and many countries across Europe. I saw people from Germany, Italy and Finland just as a start. If Roger Goodell needs any more proof that there are dedicated and loyal NFL fans in England then I do not know what to suggest. Thankyou Roger and thankyou to all of the Tampa Bay Buccaneers organisation, including the fans in Florida. You sacrificed a home game to enable passionate NFL fans from Europe to witness real NFL football in the flesh, and we are forever grateful. Roll on 2010 – with maybe two NFL games in London. Can I put a bid in for the Redskins to come over please! I hope everyone has a magical day, and that the NFL message reaches thousands, even millions of new people thanks to both BBC and Sky tv coverage and those who are coming to see a game for the first time. 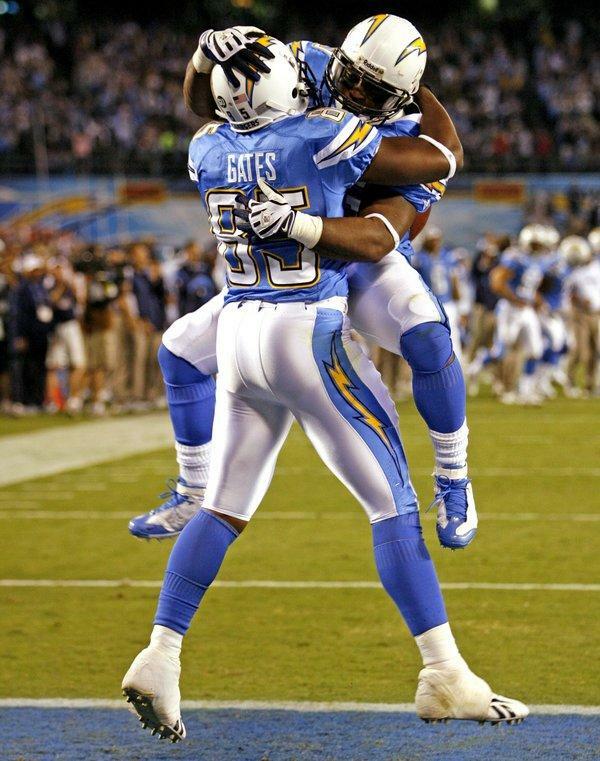 Here are a few lesser known players that I say will have some bearing on the outcome of the game (which I still have the Chargers winning 24-21)…..
Mike Tolbert (pictured left jumping on Antonio Gates) – San Diego Chargers fullback – #35 – He is a rookie that has had to step into the rater large shoes of Lorenzo Neal – who should go to the Hall of Fame as one of the greatest players in his position. Tolbert has made 10 catches so far, averaging 13.4 yards a catch, and with so much focus on LT it could be Tolbert that converts some crucial 3rd downs. Eric Weddle – San Diego Chargers safety – #32 – He is another young player in only his second season, but surprising to some he is leading the Chargers in tackles with 59. He is able to sniff out where the ball is, and is on course for over 100 tackles in only his first full season starting. Weddle will no doubt cover every blade of Wembley grass today, so look out for him laying hits on the likes of Jeremy Shockey and Matt Campbell. Billy Miller and Mark Campbell – New Orleans Saints tight ends – #83 and #80 – Now people all know Jeremy Shockey and for those at Wembley for the Giants win over the Dolphins they will be familiar with the ink armed warrior. It has been the likes of Miller and Campbell that have been moving the chains in Shockey’s injury absence, and helping Drew Brees to rack up those yards. Both are support acts, but both have great hands, and if the Saints go into a two TE formation they could find gaps in the Chargers secondary for crucial 10 yard gains. Miller in fact is averaging 15.1 yards a catch on his 16 catches which is over a third more than Shockey’s 9.6 on 21 catches. Kendrick Clancy – New Orleans Saints defensive tackle – #71 – Clancy has bounced round the NFL having played for the Steelers, the Giants and the Cardinals, but he looks to have found a good home in Louisiana. He has started all 7 games this season, gaining 20 tackles and two sacks. Clancy will be one of the guys that fans new to the game will find hard to track in the pile of bodies each down, but Clancy plays hard and can do a great job getting his hands on LaDanian Tomlinson. Lance Moore – New Orleans Saints wide receiver – #16 – Very quietly Lance Moore actually leads all Saints wide receivers in catches with 32 (for 341 yards) after 7 games. The likes of Marques will get the headlines because he is the stud and coming back from injury, and Devery Henderson has an eye popping 31 yards a catch, but it is Moore that comes up with the clutch catches time after time. With Reggie Bush out for Wembley Moore is also likey to return kicks, so look to #16 having a huge impact on the game as he will no longer be the focus of the Chargers star cornerback Antonio Cromartie. Everyone going have fun – its gonna be like Christmas day for thousands of NFL FANS IN ENGLAND (and the rest of the UK and Europe).